Just wanted to do a quick little review on the Nivea A Kiss of Mint & Minerals Lip Care. I love lip balm and this one is great! One of my beauty must do's is to put lip balm on at night. I keep it on my night stand and right before bed I have to slap some on. I hate to have dry lips but with this lip balm you wake up with soft, moisturized, lips! 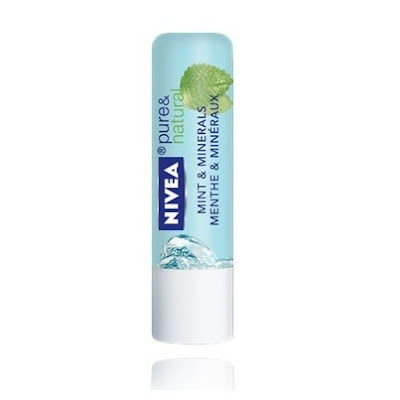 Nivea PURE & NATURAL MINT & MINERALS contains refreshing Mint Extract and precious Minerals that make your lips look and feel soft, healthy and naturally beautiful. With natural ingredients like certified bio shea butter and natural jojoba oil the formula provides a refreshing soft tingling feeling. It's 100% free of preservatives, and dermatologically approved. I have been applying this faithfully every night. And I must say, I do wake up with luscious, soft lips. With this product on my night stand there will be no dry cracked lips for me this winter! If you are in the market for a new lip balm then this is a must try. A Kiss of Mint & Minerals Refreshing Lip Care is $2.99, and you can find the product at drugstores, grocery stores and online. OOh sounds tempting, I love Nivea lip balms. I've been planning on getting the Kiss of Smoothness, I think I'll check this one out too. This is super helpful, I've been looking for a lip balm to put on in the evenings before bed especially now that my lips are getting more chapped in the colder weather.